Colourshift. 2014. LED light fixtures and sensors. 3000 x 400 cm. 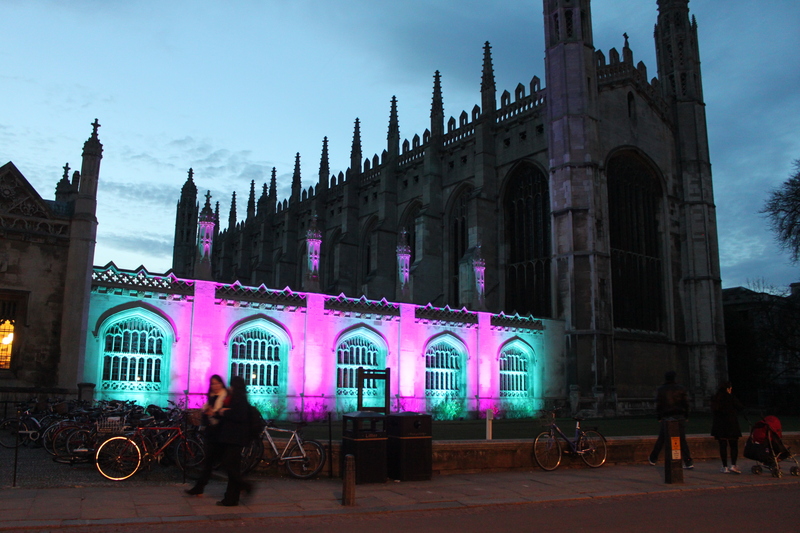 King’s College, Cambridge as part of the e-luminate Festival. My work and research explores how we perceive and experience form and light as we move through our urban spaces. The work attempts to enable people to become more aware of the minimalist beauty that exists in the geometric structures in our cities. It focuses in particular on transitional non-spaces. My work has been shown around the UK, in Japan and Finland, in galleries and the public realm. I have made work for BBC Scotland, The Cambridge Institute of Astronomy and for Charles Saatchi at the Big Chill Festival. I am part of this e-collective, because I am very keen to consider how the arts can promote sustainability around the world and took part in the 2014 Sustainability Residency in Cambridge. I see the collective as a fantastic opportunity for career development, to meet artists and people involved in sustainable projects and to showcase the best of sustainable art. I am involved in the Cambridge e-luminate festival, where I collaborate with the clean technology sector in Cambridge to create art work that promotes how lighting can be sustainable. In my practice I am interested in creating work that makes people respond to or reflect on what is around them in a different way. I often work using optical illusions or try to change a reference point or point of view and I think this could be particularly interesting in relation to sustainability. I believe as a visual artist it is often difficult to talk about sustainability as we are constantly producing more and more for the world. But I feel that if there is anything that can justify more production in the world then it is culture. Further to this, if culture is combined with an increased awareness of the importance of sustainability it can be a strong way to convey important messages. My work is about making people aware of the beauty that exists in the world and therefore what we stand to lose if we do not consider our impact on the environment carefully and I am interested in the idea of using lighting to highlight how we experience the world and how we can have a lot of impact without using too much lighting.